As much as Virginia is for lovers, Luray is for Appalachian Air Canine lovers. We are back in this pristine mountain town for the 11th connsecutive year. This time, they have a little bigger space for us to enjoy our frisbee dog games, and for the first time we’ll be competing at Inn Lawn Park (Retrieve Trial, Toss/Fech, Bullseye, & Freestyle). Pot luck picnic takes place in the evening back on the expansive lawn at the Days Inn. Each team that enters will get a Frisbee thanks to our sponsors, F&M Bank. 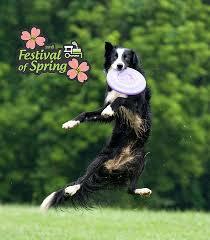 There will also be Frisbee awards for the winners of each event. Entry fees: AAC Members $8 first dog/$5 each additional; non-members $10/dog. Anyone competing for the first time (both dog and human) are FREE; your entry fees are sponsored by the club. This is a bit different from our usual format because we usually get a lot of foot traffic, and this gives more people a chance to enjoy the freestyle routines. Also, if you’re planning to come (or even thinking about it) and know what song you want to use for freestyle, please email your song to Ellen with your dog’s name and freestyle level (Beginner, Advanced, or Pro) by Thursday, May 3. (If it’s not an edited song and you just want to send the name of the song, we’ll get a copy of the song downloaded.) Also, if you’re using music from a previous year, just let me know what song you want to use. For those interested in staying in the area, the Days Inn is a great place for the dogs, and several club members stay there. There are large fields surrounding the building that the dogs can play in. We will be having a potluck after the event at the Days Inn (you don’t need to be staying there to join!). If you know what you’re planning to bring, please post it so we can get a variety of food. Also, the potluck will be a BYOB event for beverages, so plan accordingly. For those coming Friday night, we’ll try and head over to Hawksbill Brewing Company. As usual, we’ll need help running the event, so I’ll be looking for judges, announcers, registration and data entry help, as well as help with set-up and breakdown. Please let Ellen know if you’ll be able to help out.